Sybil Carlisle (1871-1951), Actress; sister of Mary Helen Carlisle. Sitter in 4 portraits. Ellis Jeffreys (1872-1943), Actress; wife of Herbert Sleath Skelton. Sitter in 31 portraits. 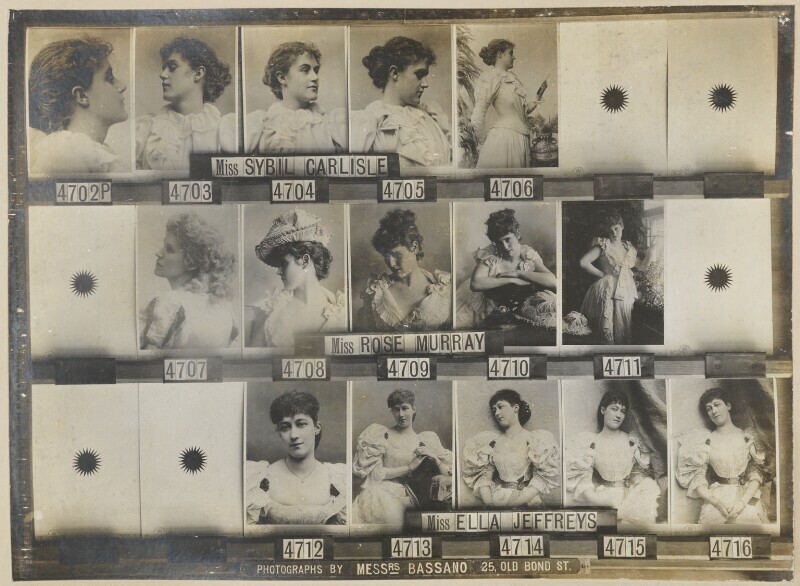 Rose Murray (active 1888-1894), Actress. Sitter in 2 portraits. Alexander Bassano (1829-1913), Photographer. Artist associated with 2806 portraits, Sitter in 4 portraits. Prime Minister Lord Salisbury resigns and is replaced by his nephew, Balfour, who this year introduces the Education Act, which controversially hands control of secondary education from school boards to Local Education Authorities. Arthur Griffith, leader of the Society of Gaels, introduces a policy of 'Sinn Fein' at a Society meeting in Dublin, which includes passive resistance to the British and the establishment of an Irish ruling council. Joseph Conrad publishes his short story The Heart of Darkness, a powerful critique of European imperialism. Based on his experiences in Africa, the narrative follows Charles Marlow's journey into the Belgian Congo in search of the mysterious trader Kurtz. In New York, Alfred Stieglitz founds the Photo-Secession movement, a group of US photographers influenced by the Pictoralist movement, seeking recognition of photography as art in its own terms. The first Aswan Dam is opened on the Nile, at the time the world's largest dam. The gravity dam, 1900m long and 54m high, was designed by Sir William Willcocks and built by engineers including Sir John Aird, whose firm John Aird & Company was the main contractor. The Boer War ends after the Boers accept their loss of independence under the Treaty of Vereeniging, bringing the Boer republics under British control.